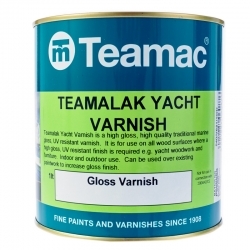 Teamac Teamalak Yacht Varnish is an extremely high gloss varnish and a marine grade coating. 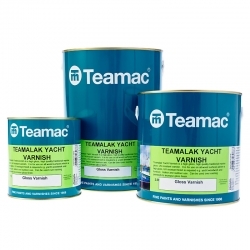 Teamac Teamalak Yacht Varnish is for use on all wood surfaces where a high gloss, UV resistant finish is required for example yacht woodwork and furniture. 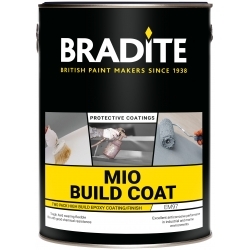 It is recommended for indoor and outdoor use and can be used over existing paintwork to increase the gloss finish and durebility. 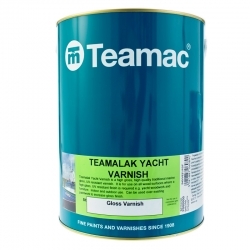 Teamac have been manufacturing yacht varnish since 1908. This high gloss, high quality yacht varnish has been carefully produced to provide you with long lasting protection. Teamac Teamalak Yacht Varnish is extremely flexible meaning that it resists cracking and peeling by flexing with the movement in wood. 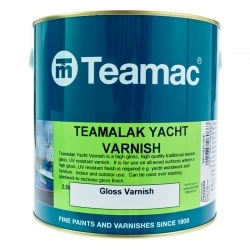 Not only is Teamac Teamalak Yacht Varnish perfect for use on marine vessels but is ideal for use on exterior doors and windows frames. 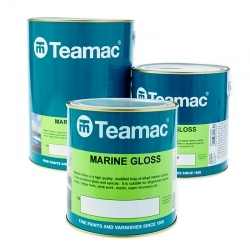 Whether your protecting or restoring your woodwork, Teamac Teamalak Yacht Varnish will ensure a high gloss surface, rain or shine and provide years of protection. 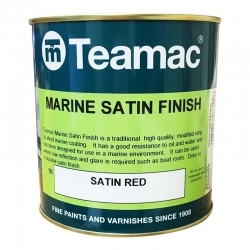 Teamac Marine Satin Finish is a traditional high quality, modified long oil alkyd marine coating. It has a good resistance to oil and water and has been designed for use in a marine environment. Can be used where low reflection and glare is required such as boat roofs. Dries to a durable satin finish. 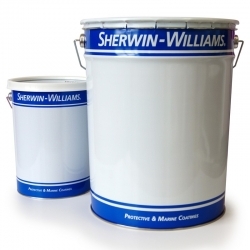 Sherwin-Williams Macropoxy L524 (formerly known as Epigrip L524) is a high build 2-pack modified epoxy coating for immersive protection in salt water, fresh water and crude oil. Recommended Uses Protection of ships bottoms and cargo tanks Submerged/splash zone areas of marine structures Jetties External protection of buried and other pipelines. 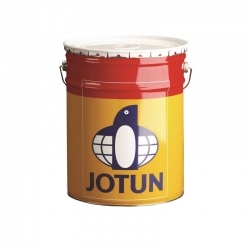 Jotun Spontan Varnish is a clear, one component oxidatively drying urethane modified alkyd coating with a gloss finish that has good gloss retention. 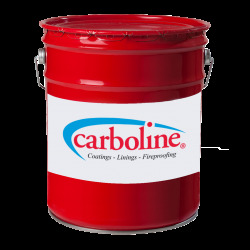 To be used as varnish in atmospheric environments on properly prepared wooden substrates.